When I was in Jakarta, Indonesia last year, I had such a swell time just relaxing and getting pampered from head to toe. Day in and day out, my four-day itinerary was filled with stuffing myself silly with local delicacies, shopping, visiting their spas for massages, as well as beauty salons to give my frizzy mane and nails a little TLC. Everything was cheap and good, so what’s there not to like? But only on my last day did I discover about Go-Glam and Go-Massage (both subsidiaries of Go-Jek), which bring a range of indulgent services into the customers’ living rooms. Manicures, back rubs and even waxing – you name it, they have it. I thought this was a very nifty and convenient service, and pined for a similar on-demand platform to be made available in Singapore. Well, my prayers have since been (partially) answered, thanks to the folks behind The Outcall Spa. Stella Tan, 37, and Amber Chong, 38, got acquainted with each other thanks to their 8-year-old daughters (who are each other’s BFFs). “We are both crazy about massages, and have gone for spa services locally and overseas. We often share with each other our favourite spas and talk about how they can do better,” said Amber. As avid massage enthusiasts, it was a natural progression for them to start up their own spa business. But here’s the twist that makes them stand out from the rest of their competitors: a mobile massage spa service. According to Amber, the duo focuses a lot on the customer experience and pays utmost attention to nitty-gritty details in setting up the perfect relaxing atmosphere to emulate a real spa. From a full-sized massage bed, scented candles, dim lighting and tranquil music, to thick and fluffy towels to adorn the massage station, customers are guaranteed a blissful 90 or 120-minute massage. A warm glass of ginger tea – directly imported from Indonesia – is also served to customers to wrap up the session. 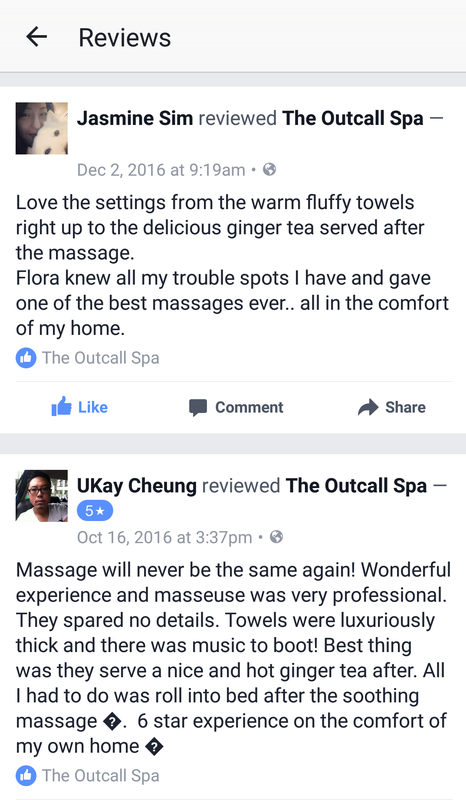 And since they bring the spa services to them, it really makes it convenient for customers as they can save time and effort on traveling. Launched in February last year, the duo pumped in $100,000 of their savings to start up The Outcall Spa as a side business. But they’re still holding on to their day jobs – Stella works as an interior designer, while Amber is a senior business development manager with a Singapore MNC. The latter has also ran a few e-commerce businesses prior to this. Word from customers is that they are very impressed that they operate till 2am, yet don’t charge any late-night or transportation fees. The Outcall Spa is still a fledging startup. They are a growing team from 1 to 4 people, and are looking to expanding to 6 therapists by year end. “All therapists are certified and have more than 6 years of experience in hotel spa,” said Amber, confirming her staffs’ credibility. She added that they are very stringent in their hiring process and have interviewed more than 50 therapists in a month. But thankfully, response has been very positive so far and the business have broke even at their 16-month mark. Sharing about future business plans, Amber said that they are looking to expand their service line and introduce hand, foot, and nail care treatments in November this year. So besides kneading the knots away, customers can soon look forward to manicures and pedicures as well. Check out their Facebook page to learn more about their services, and if you are keen on engaging their services, you can book an appointment with them here.